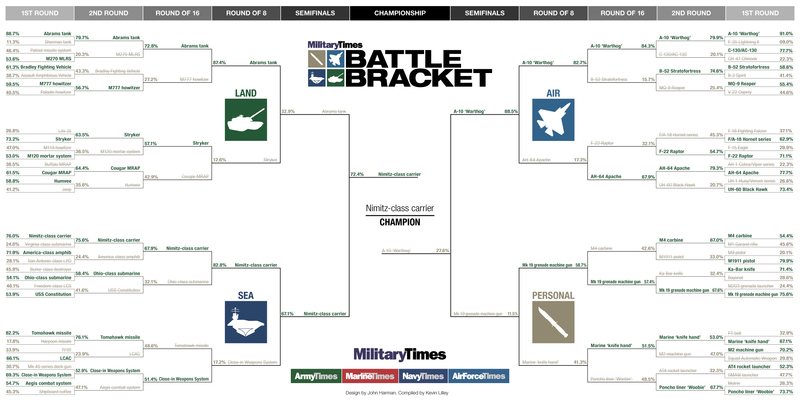 The Nimitz-class carrier has sailed past the rest of our entrants to claim the Battle Bracket championship. Thank you to everyone who voted; read more about the winner and the contest here and get full coverage, including round-by-round updates, at battlebracket.militarytimes.com/. Want more from Military Times? Submit your email to receive updates on new products, services and special offers. ©2016 www.militarytimes.com. All rights reserved.